What are the arguments of the Wife of Bath in relation to marriage? How do you integrate her Prologue and her story into a coherent whole? What are the arguments of the Wife of Bath in relation to marriage? How do you integrate her Prologue and her story into a coherent whole? Acclaimed as the "Father of English Literature" and "the English Homer" before William Shakespeare, Geoffrey Chaucer, the writer of The Wife of Bath's Prologue and Tale, was born to a middle-class family in ca. 1343 and was once a member of the house of Elizabeth, Countess of Ulster. Regarded as one of the most famous and significant poets in the medieval period, Chaucer was well-known for his use of dream-vision form, his masterpiece The Canterbury Tales (ca. 1387), and more importantly, his contribution to the English language by importing more than 1000 new words that were derived from foreign languages. In The Wife of Bath's Prologue, Chaucer's precise presentation of the Wife of Bath's "experience" (line 1) of marriage, which she believes to be "right ynough for [her] to speke of wo that is [inside]" (lines 1 - 3), brings forth to her convincing arguments about marriage. Obviously in the beginning of the Prologue, Chaucer suggests the idea of the Wife of Bath as being a five-time, experienced married woman, whose first marriage experience comes when she is only "twelf year of age" (line 4). The wise woman is without doubt an advocate of marriage, as she is always ready to 'fight back' all kinds of attacks concerning her marrying five times with her strong, convincing arguments with references to the Bible - although she "graunte it wel" (line 101) the truth that "[one] does well not to marry" (1 Corinthians 7.1), as "it would be better to continue to live alone" (1 Corinthians 7.8) as a widow, the Wife of Bath strongly believes that there is nothing wrong to marry more than once, as she always agrees with the idea that "to be wedded is no sinne" (line 57) ...read more. of her husband, who arouses his absolute "anger and jalousie" (line 494) and "twists" (line 500) him into his final fate - dies of anger. Being a clever-manipulation practitioner, the Wife of Bath's 'formula' of a perfect marriage works best when she is with her fifth husband. Her fifth husband, who is only twenty years old, is of remarkable contrast to the four preceding husbands - he is "so fresh and gay in [the] bed" (line 514), has "legges and feet so clene and faire" (line 604), and does well in "glosing [her]" (line 515). According to the Wife of Bath, he meets her requirements as he is sexually energetic and attractive. As a result, the man is capable of "[winning] [her] love anoon" (line 518), and the Wife of Bath herself feels strongly that "[she] [loves] him best" (line 519), even though "his love [is] of daungerous to [her]" (line 520). Chaucer, through the description of the Prologue, suggests that the Wife of Bath feels satisfied with her husband and she is married for love - she loves him so much that "[she] yaf al [her] herte unto his hold" (line 605), and even "yaf al the land and fee that evere [is] [her] yiven therbifore" (line 636 - 637). The husband, however, struggles to convert her to be a more ideal wife by reading the book "Valerius" (about wicked women), which is to me, a means to practice manipulation. Here we expect to see the husband gaining the absolute control over the Wife of Bath, who is then timid and submit to her beloved. Nevertheless, when things turn out that the Wife of Bath cannot withstand the 'torments' anymore, and dares to 'fight back' to hit her husband and tear three pages out of the book, we know that she has 'got used' to be under control, and is ready for a 'rebellion'. ...read more. and "holde it best" (line 1244) that their wives take the sovereignty in their marriage. The similar ending, to me, is the 'fruit' of their hard work - they gain the 'victory' of their 'battle of marriage' with their patience and the use of convincing, tactful devices. As mentioned above, the Wife of Bath is satisfied with "[her] power [to] [manipulate] [men] during al [her] lif" (line 164), and her 'formula' of a perfect marriage works effectively with her five husbands. 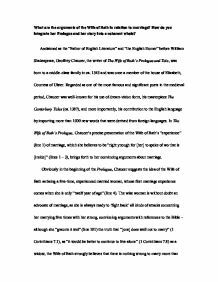 Therefore, Chaucer's use of the tale is without doubt a strong support of the Wife of Bath's arguments, as he has presented here a 'real-life' example of the effective practice of the 'formula'. The existence of both stories is, to me, the best example of the integration of the Prologue and the Tale - they are so well integrated that their existence is of mutual benefit to each other - with the story of the Old Wife, we are convinced that though the Wife of Bath's arguments about marriage are in some sense, subjective, she really has the "experiences" in marriage that enable her to design her 'strategies' to cope with different husbands of different characteristics. In addition, as we benefit from our preceding reading of the Prologue, we understand the arguments of the Old Wife better, and find the ending of the Tale more acceptable. Chaucer suggests in The Wife of Bath's Prologue and Tale that when women get everything, including the sovereignty over the marriage, they will be kind to their husbands as they will not abuse their authority and mistreat their husbands. However, in the real life, women are usually morally and physically inferior to men, and thus, the Wife of Bath's 'formula' of a perfect marriage is only good for her case. Despite the truth, we benefit from Chaucer's tactful use of the tale as a support of the arguments written in the Prologue. In conclusion, the Prologue and the Tale are well-integrated that they express ideas coherently, which makes their existence a lot more valuable. ...read more. In contrast, a feature such as his 'forked berd' may contain a hidden meaning, although a fashionable cut, it is usually associated with the devil and conveys a duplicitous person. Furthermore the source of mystery surrounding the Merchant includes the ambiguity of his name and the nature of his affairs. Ideas of Feminism and the Wife of Bath. Soon after he died she married Jankin, her fifth husband and according to her, the most challenging of the five and also the most abusive. Alison admits to marrying him for love yet he was also half her age the younger. She is greedy and wants more money. Both the authors portray a similar relationship between the men and women in both stories. Joanna and Shadrach Jolliffe have a relationship in which the wife is the dominating character. Shadrach will do whatever his wife tells him too, as he is an honourable man. Man and Wife by Robert Lowell. This explains that he was so in love with her that his heart came up to his mouth this usually happens when you are nervous and can't express what you want. In the last stanza the poet says "Now twelve years later, you turn your back/ Sleepless, you hold / you pillow to your hollows like a child". She is once again, trying to make people laugh at him however the audience do not react to this. Since throughout the story we have been reacting just like the residents in Unity Mansions we know that we are not meant to laugh. do not return, the text says she becomes " a skeleton of something human". Mrs Bodman is not described much in "An Alpine Divorce", but we do learn that she is very uncompromising. She marries a man similar to her, which leads him to hate her.